So you have made your lovely loaf of bread in your bread maker and the winter nights start to draw in so what can you use to warm yourself up? Surely there’s nothing better than a nice bowl of soup where you can dip your soldiers into? Added to that is the fact that freshly prepared soup is so much better than your off the shelf alternatives. So, with that mouth watering thought in mind, we thought we would have a look at some of the best soup makers to buy so that you will be able to make your own soup with your chosen ingredients, that way you know what is in it. So what makes the best soup maker? How easy the soup maker is to use? To prepare your own soup by hand is a time consuming task, so you do not want to be taking almost as long to make your soup with your soup maker. How much soup the soup maker can actually make. If it can only make a mug sized amount then that will be no good for a family but would be fine for a single person. The power rating for the unit is also important as it will let you know how powerful the soup maker is as they also blend the ingredients in the making process so the more powerful the motor the better the consistency unless of course you want chunky soup. Finally, the actual cost of the soup maker as you don’t want to spend a fortune on them so it has to be value for money. All that you need to do with this is to cut up your ingredients into pieces about 2cm in length, then put them into the soup maker, choose your consistency of smooth or chunky and set it off to be able to make soup for up to 4 people in as little as 25 minutes. The control panel on the lid also has a LED display so that you will be able to see the time remaining before your soup is ready. You also get a basic recipe book with the 48822 soup maker to get you started. With the addition of the blender incorporated into the lid of the unit you can also use it to make yourself a smoothie or milkshake which would be a perfect alterative on a hot summers day. The 1000Watt Morphy Richards 48822 is 16.5cm x 13.5cm x 32 cm in size and made from stainless steel. This is one of the lower priced models and defiantly worth considering if your budget is a bit tight. The Morphy Richards 501014 shares a lot of the same features as the 48822 model, however it has one major difference. T his model has a in built sauté function which means that now after preparing your onions, garlic, spices, ginger or bacon you can add the oil to sauté them directly in the soup maker before adding the rest of the ingredients and setting off the actual soup making process. Once again you can choose if you want a soup with chunky pieces in it or if you would rather the soup to be smooth. Incase you need to add seasoning the soup maker has a pause function so that it will allow you to take the lid off to add your herbs and seasoning and then continue where it left off in the cooking process. The whole cooking process time is shown on an LED display on the handle counts down from 21 minutes for smooth soup or 28 minutes for chunky soup to completion, and it bleeps when it has finished. Of course soups are not the only thing that this can make as it’s serrated blade is very efficient at blending so you can juice or make smoothies with this. To get you started you are provided with a number of starter recipes in the instruction book. After you have finished cooking the soup maker is easy to clean as well with warm soapy water. This 1000Watt brushed stainless steel soup maker is 22.4cm x 17cm x 31cm and is a mid ranged priced soup maker, but well worth the money and is our personal favourite. The VonShef 800W Soup Maker is 26cm x 22.2cm x 33.8cm and made of stainless steel. Featured on ITV’s “This Morning” program it can not only make you your chunky or smooth soups but among the other things that it can do is make smoothies, crush ice and blending as well as being able to make cocktails. There are a few in built safety features like its ‘Anti-Dry’ and ‘Overspill’ controls for your safety. It has a 1.6 litre capacity which should be able to feed 4 adults. The recipe book that comes with the soup maker has some handy recipes in it but sometimes refers to features not present on this model. This is currently available at the low price range and is good value for money though not as powerful as the Morphy Richards 48822. The Tefal BL841140 Easy soup maker is a 1000 watt white and metal soup maker. It is 16cm x 23cm x 34cm in size and has a capacity of 1.2 litres. The Tefal has automated buttons to create your chosen soup be it smooth or chunky and there is also a manual mode for you to create your own. The programs also make non heated blends and composites should you wish. Once you prepare your ingredients and select the cooking mode the soup make will prepare your soup and upon completion will alert you that it has finished and enter the automatic ‘keep warm’ mode. This mode makes use of the double layered insulated walls of the soup maker and keeps the soup warm for up to 40 minutes. After you have finished there is a clean mode which will speed up the cleaning of the soup maker after the lid has been removed. Once again you also get a quick recipe booklet with this to get started as soon as you get it out of the box. This mid price ranged soup maker is good value for money and well thought after by customers, but the slightly smaller capacity and lack of the sauté option just put it behind the Morphy Richards 501014. The Salter EK1548 1000Watt Soup Maker is 36cm x 22.2cm x 21.8cm made of a 1.6 litre stainless steel jug. It comes with a handy recipes with the instruction booklet to let you get started quickly. It is fairly simple to use, all you have to do is to prepare your ingredients put them in and choose your required setting using the controls on the handle. The soup maker has inbuilt automatic controls to guard against the jug boiling dry or boiling over, and when it has finished the easy pour lip ensures that the soup only goes into your bowls. There is no sauté function or countdown timer with this, and some customers have said that the ingredients need to be stirred just before you start cooking to reduce the chance of them burning, but this is only a small amount that have had this issue. The jug is removable from the lid which makes this easy to clean when you are finished. This is currently selling in the mid price range, but I feel that you can get better value for your money elsewhere. I think that the best soup maker to make that steamy bowl of soup has to be the Morphy Richards 501014, but I do think that the Tefal came a close second. Also why not look into getting a recipe book to go with your soup maker so that you can tantalise your taste buds with an assortment of flavors! So slice up that freshly baked bread and get those soldiers dipping. Yum! It is that time of year when the weather is cold, the days are short, and a nice warm loaf of bread is pretty appealing. I know that I love waking up in the morning knowing that there is a delicious, freshly baked loaf of bread waiting for me. It certainly helps me get out of bed! We already have quite a few bread maker reviews on this blog so we’ve pulled them all together and produced a nice roundup of the best bread makers on the market in 2018. There are a combination of cheap bread makers and slightly more expensive machines. The Morphy Richards 48280 Fastbake Breadmaker is a popular choice with hundreds of positive reviews. It is one of the cheapest breadmakers currently available. 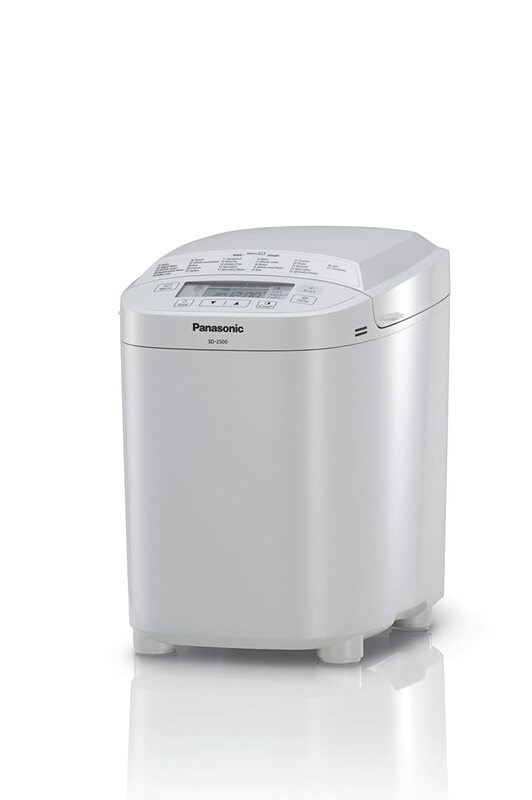 The Panasonic SD-2500 WXC Automatic Breadmaker with Gluten Free Program, White is another very popular bread maker. In fact, all of the Panasonic bread makers are well reviewed, each one has great features and it is quite hard to choose which Panasonic bread machine to buy! So why is this my favourite bread machine? Aside from loving Panasonic bread makers, this particular model is the best for us as we love the raisin and nut dispenser that it has as an extra feature. This means that you can preload your raisins, seeds, nuts of whatever extras you are putting in, set it off and leave it to cook. The machine will take care of everything for you. If you require gluten free, high fibre or low salt, it caters for that too with speciality settings. It is, in my opinion, definitely worth the extra expense. See the Panasonic SD-2501 on Amazon to see the current price and further reviews. As already mentioned it is a tough call when comparing which model of Panasonic is best – but what might swing it for you are the sheer looks of this one. Yes it has impressive features, but it looks really modern and stylish, the kind of bread maker you would happily leave out on your kitchen counter. And of course it makes an awesome loaf of bread. The separate raisin and nut dispenser can be a game changer if you like to add seeds, raisins or any other extras to your bread during the kneading cycle. The yeast dispenser, although not strictly a necessity, helps to improve the quality of the bread by releasing it into the bread maker at the optimum time. So, which bread maker should you buy ? Any of the above bread makers will serve you well. If you are after a budget model that still provides a quality loaf of bread then the Morphy Richards is probably your best bet. If you want some extra features but aren’t too bothered about having raisins, nuts and seeds added automatically to your machine, then the second option, the Panasonic SD-2500 is a good choice. 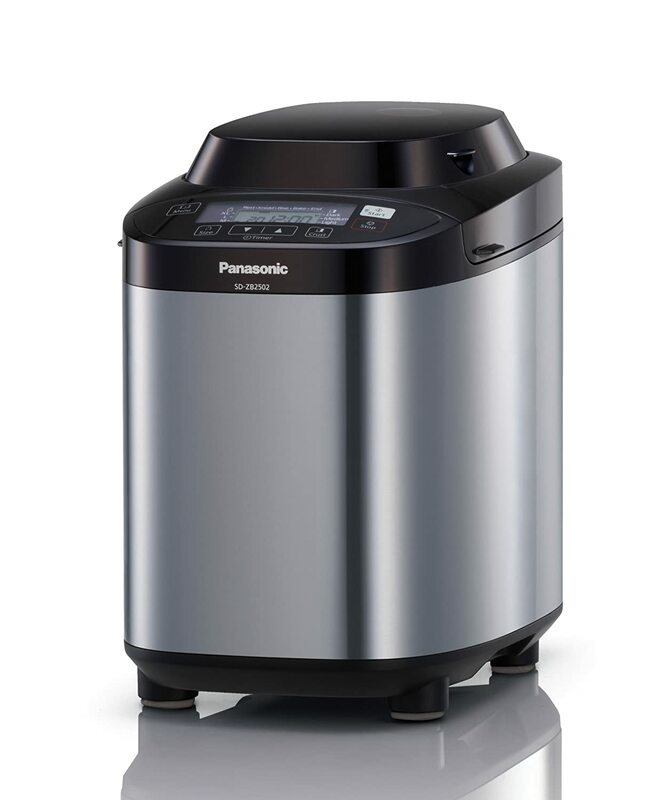 If you intend to make a wider variety of bread and the convenience of a fruit and nut dispenser is appealing then I can heartily recommend the Panasonic SD-2501 . Want to slice your freshly baked bread? Learn how here. With the Morphy Richards 48324 Premium Plus Bread Maker you have the opportunity to make a wide variety of breads, cakes, pizza dough, desserts and even jam. It is housed in a sleek ice white case that would fit very nicely in any modern kitchen. 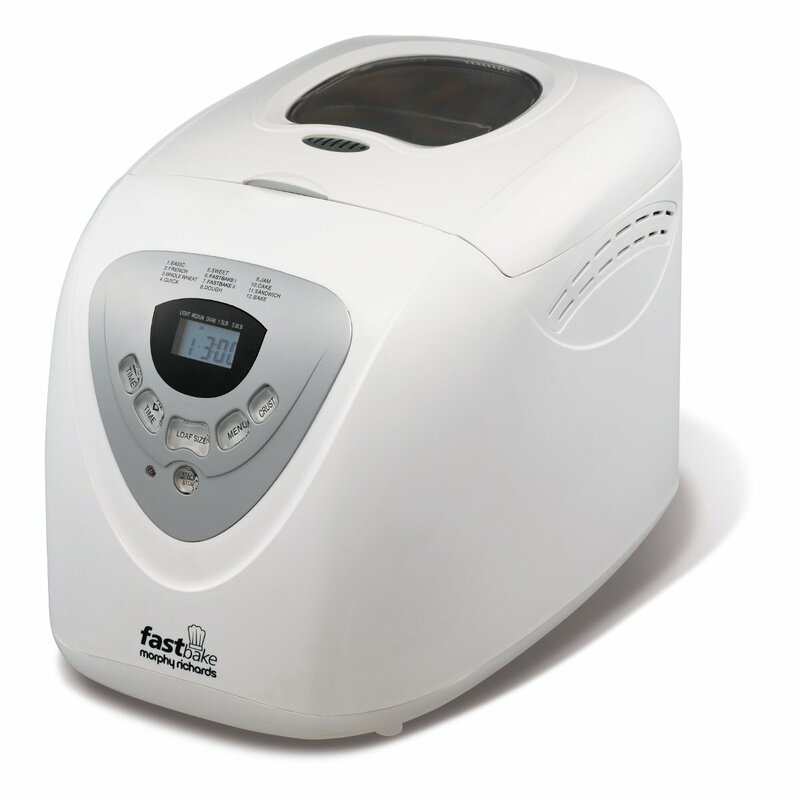 This Premium Plus bread maker machine comes in at a reasonable price. The 19 programmes included in this make for a wide variety of breads, jams, desserts or even pizza dough. Includes 2 ‘homemade’ settings to let you set up your own personal tastes according to your cooking requirements. If you are in a hurry there is a handy 70 minute fast bake programme. To aid with the bread removal after it is cooked there is a drop-down mixing blade. There is a 12 hour cooking delay timer so that you can wake to freshly baked bread. Viewing porthole with an internal light. Dispenser for fruit and nuts. 40+ recipes for you to try. With the ability to make a large selection of different dough types for whole wheat bread, croissants, tea cakes, hot cross buns, bagels and ciabatta you have in your hands your own mini bakery. And if that’s not enough then you have the ability to make a few select loaves like corn bread malt loaf and even gluten-free loaves. All of this in one of 3 sizes and 5 crust settings to make it just the way you like it. One of the criticisms with bread makers is the hole that the paddle leaves in the loaf when it is baked. That isn’t the case with this as the blade kneads the dough to the correct texture and then folds down before baking. This ensures that the loaf is smooth and doesn’t have large holes left by the paddle. This is a useful feature if you are a bit short on time. You can pop the ingredients in and set the fast bake feature, less than an hour and a half later you will have a loaf of bread ready to eat. Another handy feature which allows you the option to bake your bread while you are sleeping. There is nothing quite like waking up to the smell of deliciously home made bread. Importantly, the tin is non-stick, meaning you can easily slide the bread out without losing bits of it on the pan. If you are someone who likes to take a sneak peak at your bread while it is baking then the easy-view window and internal light means you don’t lift the lid during the baking process. The beauty of a fruit and nut dispenser means you can pre add the ingredients safe in the knowledge that once you press start everything is taken care of. There is no need to come back and add the fruits or nuts at a later time. This bread machine comes with over 40 easy to follow recipes for different breads, doughs, jams and cakes. There is no excuse not to be baking a wide variety of foods. The Morphy Richards 43834 Premium Plus Breadmaker is a welcome addition to any kitchen. It is a premium bread machine which produces great results.